Home — Dreamland Skateparks, LLC. 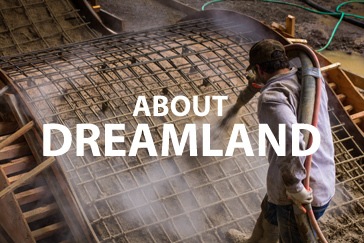 See the current projects Dreamland Skateparks are working on. Checkout Dream Team members (Founder) Mark Scott and Cody Lockwood in their video parts in the New full length Lifeblood Skateboards video riding some of their creations Lincoln City, McMinnville, and some of our private built parks Kowalskiland, Dreamland Bowl And many more hidden spots! 2016 Vans Pro Series Championship Skate Park Now Completed! A collaboration from Dreamland and Bryggerlet Skateparks, funded by Vans. For Vans Park Series, Skate Malmö are collaborating with Phil Evans in producing a series of films highlighting different aspects of Malmö as a city for skateboarding. From the skaters, to the spots, to the collaboration between the City and Bryggeriet. In Part 5 we see the new park is done!